After a massive setback last month, when directors Phil Lord and Chris Miller were allegedly fired from the production, the upcoming Han Solo spinoff is now back on track with Ron Howard coming in to steer the ship and take their place. Woody Harrelson has assured fans that the movie is in “very capable hands” and, with the news that most of Lord and Miller’s footage is still usable, it looks likely that the project will make its planned May 25th, 2018 release date after all. Continuing this reinvigorated hype around the film, Howard has taken to Twitter today to tease a certain character’s wardrobe. “Can you guess whose closet this is?” he asked his fans, along with a photo of a rack of colorful costumes. Obviously, Howard’s questions got some fun, smart-alec replies on the social media network. A few fans joked that it was Star Trek‘s Wesley Crusher or maybe the Sixth Doctor from Doctor Who, two individuals known for the bright colours in their costumes. Joking aside, though, people will will probably recognize that these jackets mostly resemble those worn by Lando Calrissian in the original trilogy. In particular, the three blue jackets towards the end of the rack. The charming smuggler was always a snappier dresser than his scruffier pal Han Solo and it’s highly likely that these clothes belong to him. 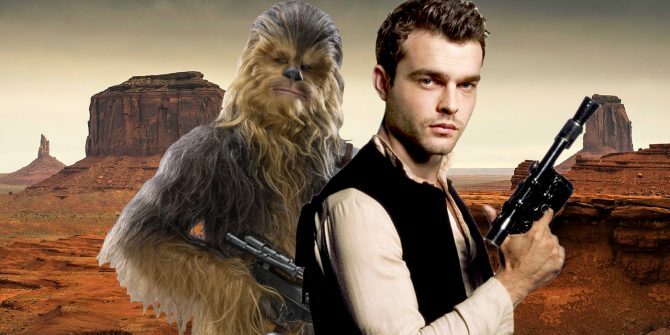 With D23 right around the corner now, we’ll hopefully learn a little bit more about the Han Solo spinoff at that point. Until then, however, take to the comments section and let us know who you think these jackets will be seen on in the film.